Once a year for the past decade, Nicholas Adams returns to Falledge and leaves a black hellebore on his girlfriend’s grave. While fleeing Falledge, he spies a shady man sneaking into the laboratory. Nicholas chases after him and dies for his trouble. A witch brings him back to life, only Nicholas is not the same man. Turns out, magic combined with a black hellebore in his pocket changed him into a kind of a super man. Julianna Paige, his girlfriend’s twin and deputy of Falledge, struggles to solve several murders. 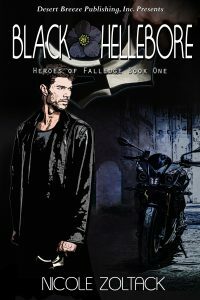 Nicholas, and his alter ego the Black Hellebore, helps her, even as she helps him move on and start to truly live again. Unfortunately, Nicholas wasn’t the only one changed in the laboratory explosion, and now a super villain is bent on destroying Falledge, and killing the Black Hellebore. But falling in love might prove more dangerous than any super villain.